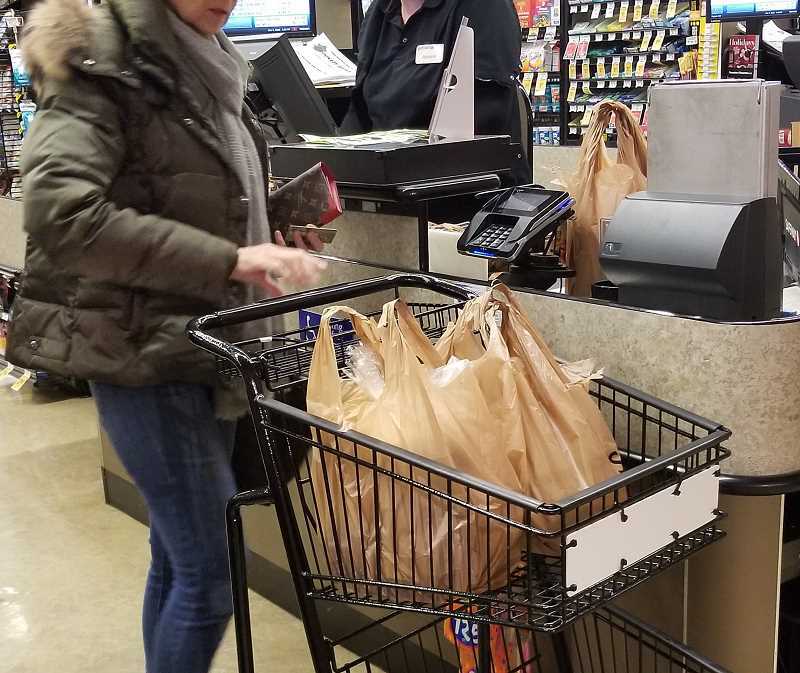 Lake Oswego City Councilors approved a ban Tuesday on single-use carryout plastic bags — including a 10-cent pass-through fee on paper bags for retailers whose stores are 10,000 square feet or larger. The ordinance requires those retailers to comply within the next six months. Smaller retailers must comply with the ban within the next year, and have the option of imposing a pass-through fee at their discretion. The ban applies to all retailers and restaurants, as well as all City facilities, the farmers market and other City-sponsored events. Violating the ordinance would trigger a written warning for the first offense, a $100 fine for the second infraction and a $250 fine for subsequent infractions. The Council briefly discussed — at the request of Councilor John LaMotte — increasing the fine for a first offense from $100 to $1,000, but the council agreed that $100 for every individual infraction or bag handed out was sufficient punishment for violating the ordinance. "This means a lot. We've put months of work into this, talked to many different organizations and had a lot of public comment," said Jenny Slepian, the City's sustainability and management analyst, who called the ordinance "one of the most restrictive in the state." "We spoke to a lot of the grocery stores," Slepian said, "and it was really nice to have their support too." Slepian led the charge to ban single-use plastic bags in Lake Oswego, working with Councilor Joe Buck, City staff and organizations like the Northwest Grocery Association and Surfrider Foundation to make it happen. The ordinance passed by the council Tuesday applies to "any bag that is provided by a retail establishment at the point of sale to a customer for use to transport or carry away purchases." There are a number of exceptions, however, that will allow use of plastic bags for specific reasons. Those exceptions include produce bags, meat bags, bulk food bags, pharmacy prescription bags, dry cleaning bags, bags needed to contain prepared liquid takeout and bags purchased for non-carryout purposes, such as sandwich bags, garbage bags, dog poop bags, etc. Councilor Theresa Kohlhoff voted against the ban for that reason, saying the number of exceptions, as well as the 10-cent pass-through fee on paper bags, wouldn't create any sort of behavioral change to get consumers to start bringing their own reusable bags. "There are so many exceptions (in this ordinance), you could drive a truck through it," Kohlhoff said. "I get that we're trying to ban plastics; a number of you spoke eloquently about plastic. You're not going to get an argument from me on that. It's about the paper bags." But according to Slepian, cities that do not have a pass-through charge on paper bags — such as Portland, for example — saw an increase in paper bag usage by as much as 400 percent. The whole point of the fee is to change behavior, she said, and the rest of the council agreed that the 10-cent fee, which will be collected by retailers, was a good addition to the ban. Most other cities have adopted a 5-cent pass-through fee, Slepian said. Tuesday's 6-1 decision comes as cities across the state and country — including Salem, where a ban was approved last week — debate the use of all single-use plastic because of its detrimental effect on he environment. In attendance Tuesday evening was Surfrider Foundation's Oregon Policy Manager, Charlie Plybon, who commended Slepian, City staff and the council for its work on the bag ban. "I'm really impressed with what your City staff has done," Plybon told the council. "This (ordinance) is very well written and very well researched." Slepian said the recent ordinances banning plastic bags in Salem and in McMinnville served as inspiration for Lake Oswego's regulation. Having the benefit of not being the first city to do this, she said, worked to the City's advantage. According to Slepian, her task over the next few months will be educating both retailers and the public on the new ordinance. She said that videos seem to work well with getting information out to the community, as well as direct messaging through the mail. Slepian is also working on partnerships with Clackamas County and Republic Services Inc. to acquire a large shipment of reusable bags to distribute to community members in an effort to help ease the transition to the new ban.